Two teams race to identify drawings done by their own team members. But the artists donâ€™t know what they are drawingâ€”they can only follow the instructions given by another team member. Laughter erupts as players attempt to follow direction and to guess what is being drawn. 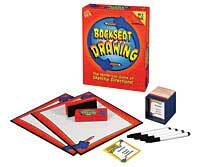 With Backseat Drawing, thereâ€™s no time to stop and ask directionsâ€” the fun never stops! The Challenge Cards feature four languages: English, Spanish, French, and German. Play in the language of your choice!